Revenue was down 7 percent, mainly due to lower volumes and divestments. Weaker European end markets and production issues in the Specialty Chemicals value chain adversely impacted our results, with operating income 8 percent lower at €217 million. Cash from operating activities improved €298 million, mainly due to lower pension payments. Revenue in Decorative Paints declined 5 percent, mainly due to lower volumes in Europe, price/mix and currencies. Volumes were lower in Europe and South East Asia, but higher in Latin America and China. Revenue in Performance Coatings declined 3 percent compared with the previous year. The slowdown in Europe impacted all businesses. Revenue in Specialty Chemicals was 11 percent lower due to divestments and lower volumes, mainly in construction related products and the pulp bleaching and plastics industries. On December 28, 2012, we completed the divestment of Chemicals Pakistan, which accounts for the divestment impact in revenue. Decorative Paints North America is reported in discontinued operations. The divestment was completed on April 1, 2013; the cash inflows and the deal result will be reported in Q2. In Decorative Paints, operating income and ROS% were higher than in 2012, mainly reflecting lower costs in Europe and lower restructuring charges during the quarter. In Performance Coatings, ROS% improved due to a combination of margin management activities, ongoing cost control and restructuring. In Specialty Chemicals, the operational performance weakened. Margins were impacted by production stops and reductions in volume. On average, raw material costs were stable compared with the previous year. Total restructuring charges (previously reported within incidental costs) were in line with the previous year. The prior year total restated incidental impact was €31 million, of which €33 million was related to restructuring charges. Decorative Paints had a higher proportion of the restructuring charges in the prior year compared with this quarter. The revised IAS 19 on pensions has given rise to the need to restate operating income for 2012 by €46 million from €862 million to €908 million (before the Q3 2012 impairment). As of 2013, we apply stricter rules to qualify items as incidental items. In addition, invested capital was redefined to exclude the receivable from pension funds in an asset position. Comparative numbers for 2012 have been restated accordingly. Please refer to our website for the details as issued at the time of our Strategy update on February 20, 2013. Achieve ROS% at 9.0% by 2015. Please refer to our website for more information on our ambitions and the strategic focus areas. Revenue declined 5 percent, mainly due to lower volumes in Europe, price/mix and currencies. Volumes were lower in Europe and South East Asia, but higher in Latin America and China. Costs were lower mainly in Europe, while operating income for the quarter, at €43 million, was higher than in 2012, reflecting lower costs in Europe and lower restructuring charges during the quarter. Revenue was down 6 percent. All regions experienced substantial volume declines, with the Southern region (France, Greece, Spain and Italy) being most impacted. However, growth was achieved in some emerging countries. The implemented restructuring measures and various operational efficiency improvement programs led to lower costs than the previous year. Revenue was flat due to an unfavorable currency impact, while volumes and prices improved, but at lower margins. Additional manpower to support growth increased our costs. Revenue was down 4 percent due to lower volumes in South East Asia and an unfavorable currency effect in India. In China, we continued to grow volume and revenues in double digit percentages. Revenue declined 3 percent compared with the previous year. The slowdown in Europe impacted all businesses. ROS% improved due to a combination of margin management activities, ongoing cost control and restructuring. Revenue declined 5 percent due to volumes and currency. In Marine Coatings, the global decline in new build activity accounts for the year-on-year volume reduction. In Protective Coatings, high activity levels continued in oil and gas, while volumes at Yacht were lower than last year. The closure of a site in Australia as part of the announced performance improvement program, was initiated during the quarter. Revenue was up 3 percent supported by price/mix and volumes, while currency had an adverse impact. In Vehicle Refinish, volumes in Europe remained weak. There were mixed results in Asia, while in North America developments were positive. Customer demand picked up in specialty finishes and aerospace. Cost reduction initiatives are ongoing throughout the business. Revenue declined 6 percent due to volumes and currency. Markets in Europe continued to be weak, resulting in lower volumes. However, growth in Asian markets partially offset the decline in Europe. On a segment level, volumes declined across the board. In particular, domestic appliance continued to suffer from the weaker economic situation. Margin management, coupled with effective cost control, offset the revenue decline. Revenue was 3 percent below 2012 due to volumes, although this was partly offset by price/mix. Growth in Asia partially offset the decline in Europe. The Wood Finishes and Packaging Coatings businesses declined in Europe. At Coil Coatings, the results from construction related activities were flat on the previous year. Costs remained under control. Revenue in Specialty Chemicals was 11 percent lower due to divestments and lower volumes, mainly in construction related products and the pulp bleaching and plastics industries. The slow start to the year for the seasonal segments such as agriculture, due to the cold weather, and the exit from the merchant fatty acids business in Boxing, China, also contributed to the volume decline. Profitability was impacted by production stops and reductions in volume. Market conditions remained difficult, with volumes under pressure in construction related products (performance additives, polysulfides) and polymer initiators. Ethylene Amines margins remained under pressure due to the continued imbalance in supply/demand. A fire at our Battleground site in the US interrupted production. Our focus remains on performance improvement projects. Volumes and margins were impacted by low caustic inventories due to an on-going large planned maintenance stop in Rotterdam. Volumes were down, mainly due to the announced exit from the merchant fatty acids business in China. Agriculture and asphalt applications were affected by cooler weather in North America. It was a weak quarter with lower volumes than last year, mainly due to divestments. The business was impacted by the devaluation of the Venezuelan currency. During Q1, our Chemical Island in Jupia, Brazil, started production, as previously announced. Operating income in other activities was in line with previous year. The “Other” costs were higher due to legacy items and one-offs. The results for pensions for 2012 have been restated for the revised IAS 19. Higher net interest (€5 million) on net debt mainly driven by a lower financing income. Higher financing expenses related to pensions (€4 million) due to lower discount rates used to calculate asset returns. Lower discount rates on provisions. The effective Q1 tax rate is 29 percent (2012: 35 percent). Net income of €89 million. Increased cumulative translation reserves (€79 million) due to the weakening euro. An increase of operating working capital of €0.4 billion mainly due to seasonality. Expressed as a percentage of revenue, operating working capital was 13.9 percent (Q1 2012: 14.8 percent; year-end 2012: 10.7 percent). An increase of €0.1 billion due to foreign currency translation, due to the weaker euro. The funded status of the pension plans at the end of Q1 2013 was a deficit of €0.6 billion (year-end 2012: €1.1 billion as reported, €0.9 billion on restated basis). Changes in accounting standard IAS 19 (effective 1 January 2013) by €183 million. 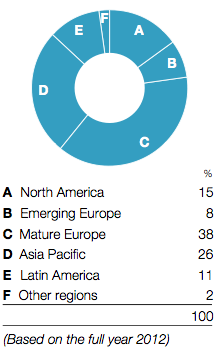 Top-up payments of €287 million into certain UK, US and Canadian defined benefit pension plans. Asset returns exceeding expected credits taken to the statement of income, increasing the pension plan assets and decreasing the deficit. Higher inflation in the UK, increasing the pension obligation and deficit. A decrease of 480 employees due to ongoing restructuring. An increase of 190 employees, mainly due to seasonal activity. Operating activities in Q1 2013 resulted in a cash outflow of €406 million (2012: €704 million). The change is mainly due to lower payments related to pension provisions. As a consequence of this cash outflow from operating activities, capital expenditures of €131 million and a cash outflow from discontinued operations of €87 million, net debt increased from €2,298 million at year-end 2012 to €2,882 million at the end of Q1 2013. This interim financial report is in compliance with IAS 34 Interim Financial Reporting. This report is unaudited. Except for the implementation of the revised IAS 19 "Employee Benefits", the accounting principles are as applied in the 2012 financial statements. Moving average ROI is calculated as operating income of the last twelve months divided by average invested capital.